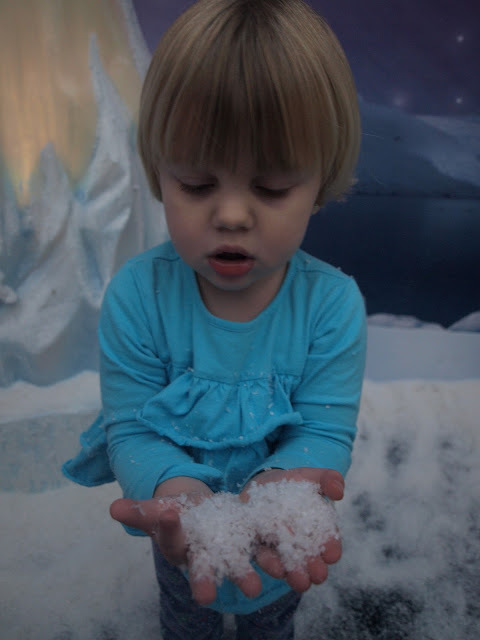 Fake Snow!!!... oh, yeah... and Santa! I decided I would take the girls to see Santa on Monday. It had suddenly occurred to me that Christmas is getting AWFULLY CLOSE!!! With Ana is school 3 mornings and Zoe in afternoon kindergarten it doesn't leave us much time to see Santa. Yes... I know Santa is around in the evening and on weekends... but we are not people who need to see Santa so badly that we'll stand in long lines. I'm lucky I can get the girls to sit with Santa when they barely have time to think about it. If they had to stand thinking for too long they would almost absolutely freak out and refuse. 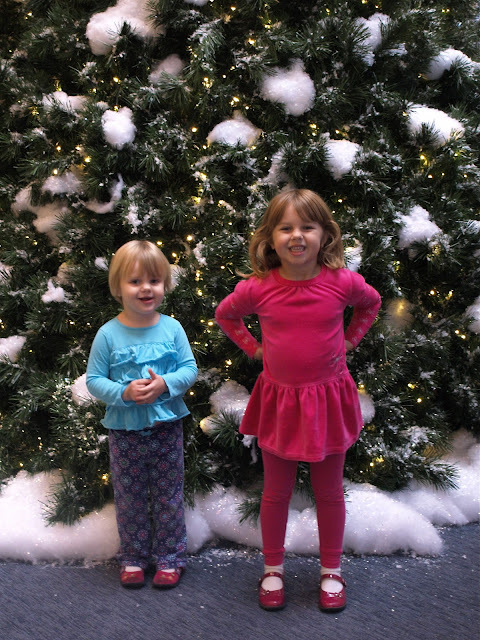 So, Monday I decided that we would visit Santa at "The Mall at Short Hills" (snooty snooty). Usually I go to the Livingston Mall. I was tight on time though... and Short Hills webs site had Santa's full schedule (and price list). Santa's Short Hill elves were obviously more organized than his Livingston elves. We found Santa and entered through the Narnia display. I think the movie would be a bit too much for Zoe... but she LOVES the commercials. She even gets Ana into playing "Narnia" and talks about portals. So... she was actually pretty interested in the display. I was personally kind of excited to see the Ice Palace... which looked like a big lit up snowglobe. 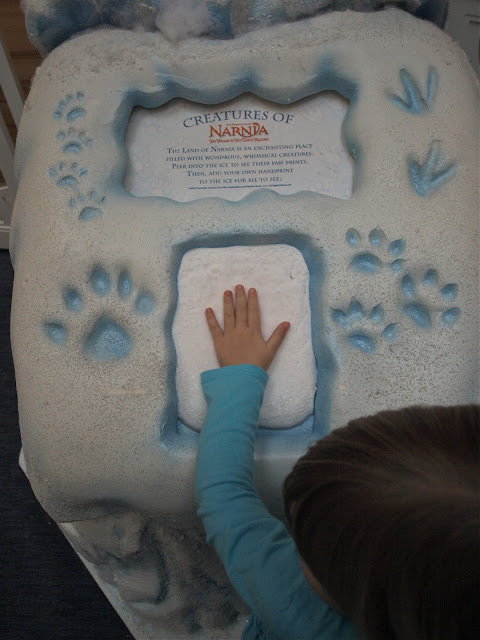 We all had to try putting our hand print in the ice. 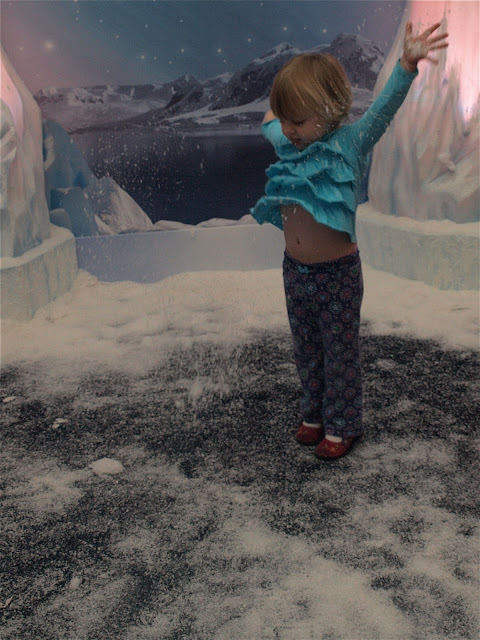 Ana was most interested and kept putting her hand to the ice and then to her cheek. Brrrr! 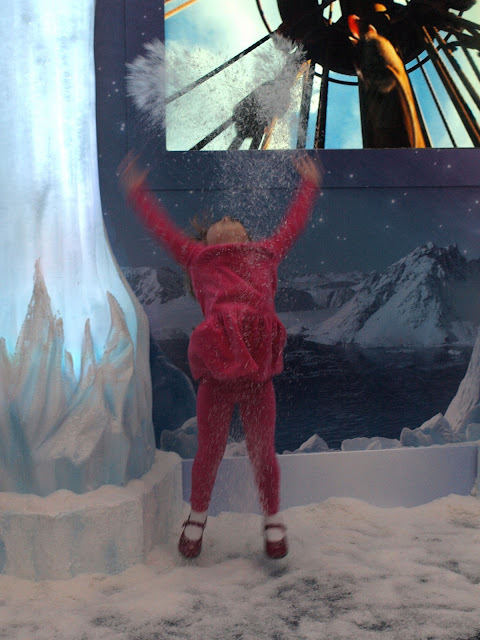 I got a quick photo of the girls standing still before going into the Ice Palace. They were a little excited. 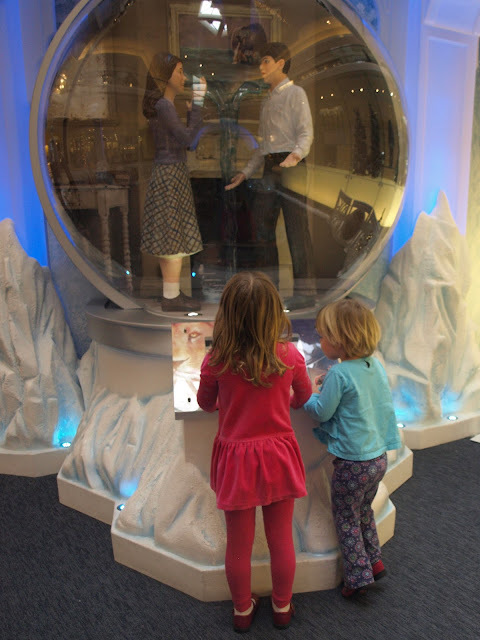 We entered the blue dome and were surprised that not only did the dome LOOK like a snow globe... it WAS a snow globe! Ana was a little nervous at first. Last Winter she was VERY clear about the fact that she does not like snow. Zoe... well... Zoe LOVES snow. Winter is her "favorite and her best". They did stand still a few times to really study the "snow". 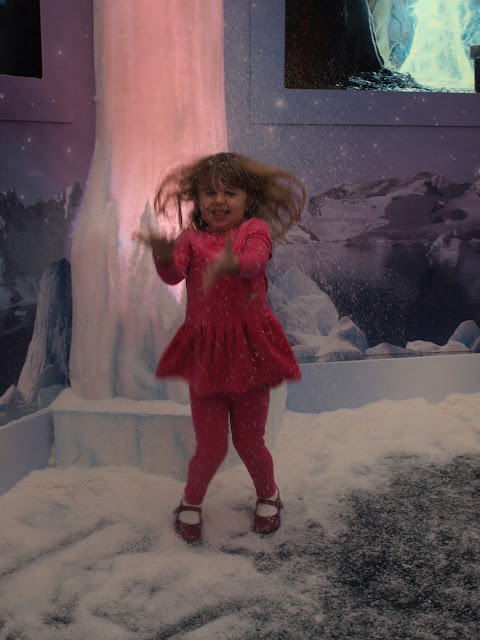 We enjoyed the indoor Winter wonderland for almost half an hour. Zoe zooming and swirly... becoming one with the snow. Ana almost surprised... stopping to tell anyone who came in "look! it's snow!" If I knew how much fun they would have had I may have been going just to play in the Ice Palace once a week since it opened in the middle of November! Zoe was truly full of joy and happiness. I think she would have moved into the Ice Palace if they would have let her. Oh Yeah!!! And Santa was there. At first sight of Santa both girls tensed up. Ana started giving me her normal "I go car now! I go car!" Zoe told me "I don't think I really need to talk to Santa.". But that above photo? The one with both girls smiling and just as jolly as Old St. Nick? All I needed to do to get both of them to scurry right up on Santa's knees was the simple promise that if they sat and smiled and got their picture taken... they could go back in the snow. That camera clicked. The "photographer" said "got it" and like a gust of winter wind they were back swirling around in the snow. Everything about our Santa visit was wonderful. Well... everything except the elves ability to adjust the printer color. Our photos were WAY over saturated with color. Very digital. I scanned and edited as best I could... but the color is just a lost cause. Doesn't really matter I guess. 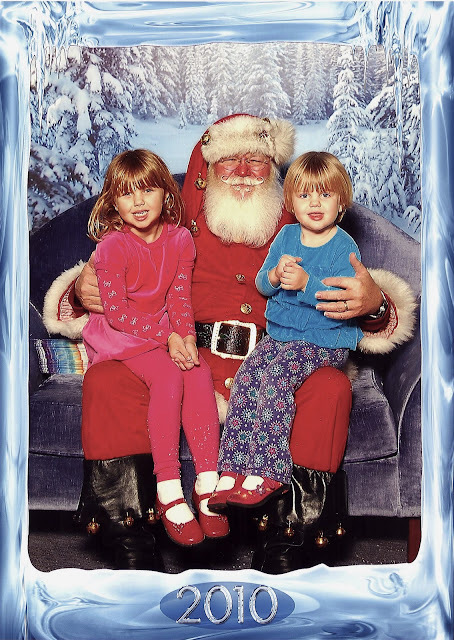 The colors are bright... but my girls are cheery and I just love Santa. 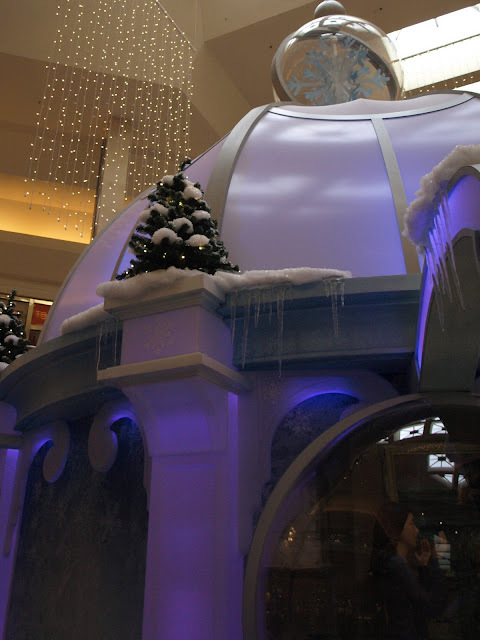 No questions about it... next year we'll be back to see Santa at The Mall at Short Hills (snooty or not).